WooCommerce Product Table is designed to integrate with the official WooCommerce Product Add-Ons extension. It’s useful if you want to show extra options in your product tables, in addition to what’s possible with variable products. For example, you can use add-ons to add checkboxes, radio buttons, dropdown lists similar to the variation dropdowns, and text input boxes. See it in action on our Product Table with Add-Ons demo page. Note: WooCommerce Product Table and WooCommerce Product Add-Ons are two separate WordPress plugins. You will need to purchase both in order to use the features described on this page. If you don’t want to buy the Add-Ons plugin, then you can add extra options to your product tables using WooCommerce product variations instead. Which add-on field types can I use in my product tables? Checkbox – 1 or more checkboxes that customers can tick to choose extra options. Radio buttons – 1 or more radio buttons, from which the customer can only select one. 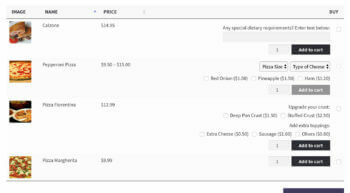 Select box – dropdown list of options, from which customers can select one. Additional custom price input – customers can enter a numerical value which is added to the product price. Useful for taking tips and charitable donations. Additional price multiplier – 1 or more quantity pickers where users can input a number, i.e. quantity. Useful if you want customers to be able to choose more than one of an option (e.g. add more than one extra portion of cheese to their pizza). Custom input (text) – 5 five in-built types of text field where customers can enter either any text; just letters; just numbers; both; or an email address. File Upload – allows the customer to upload a file which is then sent through to the administrator in the order confirmation email (note: there are some limitations, see below). It works with individual add-ons added directly to specific products, and global add-ons that you add centrally and automatically appear for all products. Install WooCommerce Product Add-Ons WP plugin and use the documentation to set up add-ons for any or all of your products. Install WooCommerce Product Table and follow the instructions to add a product table. You must include an add to cart column. View the page with your product table. 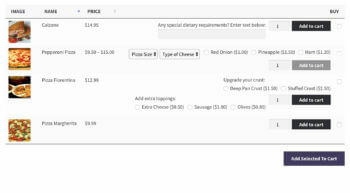 You will see the add-ons appear in the add to cart column. If you’d like to make any changes to the layout of the add-ons in the table, you can do this on the plugin settings page (instructions below). 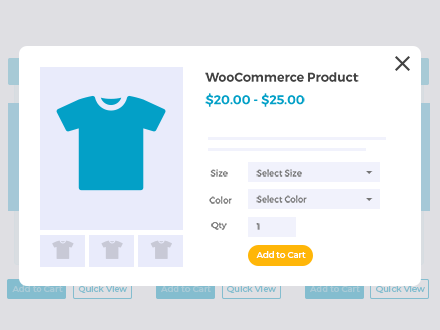 The Woo Product Table plugin settings page (WooCommerce -> Settings -> Products -> Product Tables) comes with 2 options for controlling the display of your add-ons. This option controls whether the add-on groups are listed horizontally or vertically in the table. 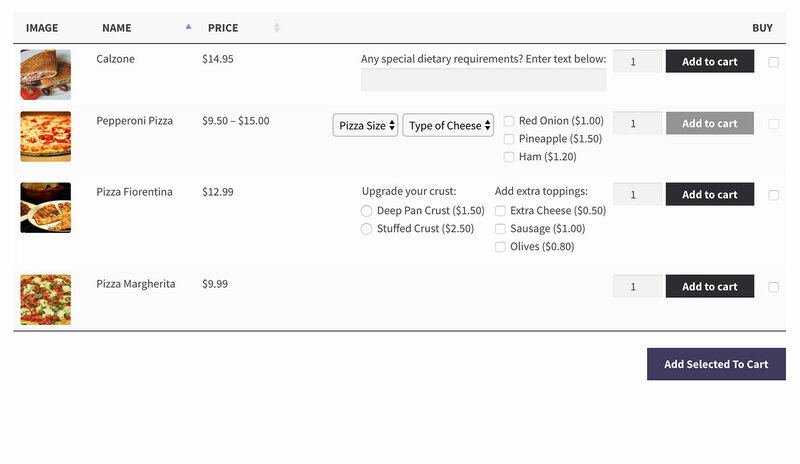 For example, a pizza restaurant might have add-on groups for ‘Crust upgrades’ and ‘Extra Toppings’, each with several add-on options. You can choose whether the overall groups are listed on the same row (depending on the amount of space available in the table), or whether a new group will always appear on its own row. Note: If you’re using variable products displayed as dropdowns in the table, then each variation dropdown is treated as a separate ‘Group’. You might want to use the ‘horizontal’ option for this setting, otherwise each variation dropdown will be listed on a separate line, which will take up more space. This option controls whether the individual add-on options (e.g. checkboxes and radio buttons) are listed on horizontally on the same row (where space is available in the table), or vertically with 1 row per option. Do the add-ons work with product variations? Yes, you can create add-ons for variable products and display all the options together in the product table. If you’re displaying product variations as dropdown lists in the table, then you can use them in addition to product add-ons. WooCommerce Product Table also has an option to list variations on separate rows. Due to the way that Product Add-Ons is coded, the add-ons aren’t fully compatible with the separate variations option. Some of our customers have found that they can successfully use add-ons with separate variations if they are added directly to each product – global add-ons will not appear for separate variations in the product table. However, we don’t officially support this because add-ons aren’t really designed to work with individual variations in this way. 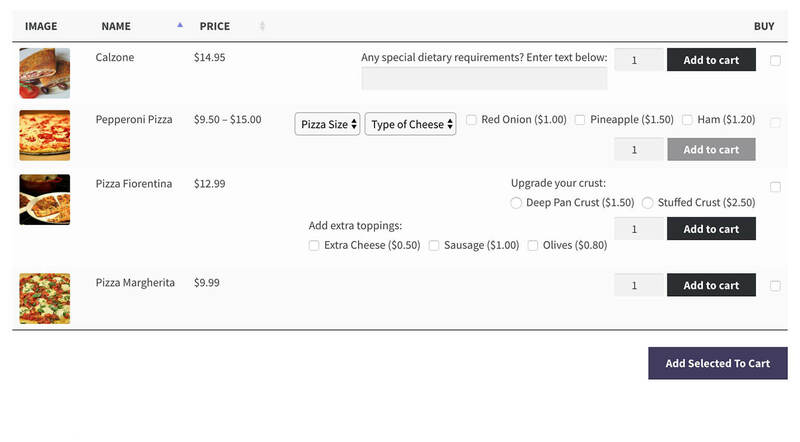 Extra options added using the Product Add-Ons plugin. While the plugins work beautifully together, there are a couple of limitations with the less popular add-on types. 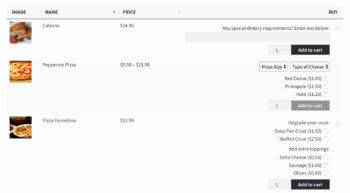 You can use the product table with the Field Upload add-on type, however this will only work if you disable AJAX cart and add to cart checkboxes. Instead, you can use non-AJAX cart and the standard add to cart buttons. Alternatively, if you display your add-ons within a quick view lightbox instead of directly in the table, then customers can upload files from the quick view window without any problems. When you add a multiple choice add-on, there’s an option for customers to click on images in order to make their selections. Unfortunately this doesn’t work within the product table, so we recommend using one of the other multiple choice options instead. 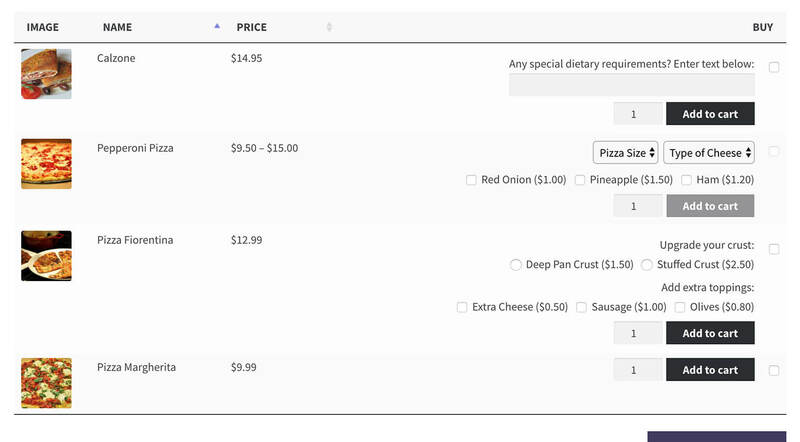 If the add-ons look messy in the table, please experiment with different combinations of the settings. There are many different ways that you can use and combine product add-ons. Some combinations look good with horizontal layouts, some look good with vertical layouts, and some work best with a mixture of the two. We recommend using trial and error to find the best combination of settings for the add-ons in your table. We’ve coded WooCommerce Product Table to handle as many add-ons as possible and to ensure that the layout looks neat at all times. However, some WC stores simply have too many product options to sensible fit into a table layout. If this applies to you, then we recommend using WooCommerce Product Table and Product Add-Ons with our other plugin, WooCommerce Quick View Pro. This lets you remove the add to cart column from the product table and display quick view buttons instead. 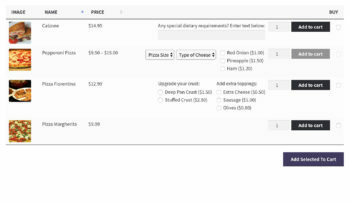 Customers can click on the quick view buttons and view the add-ons and add to cart options in a lightbox, instead of directly in the table. That way, you can sell as many add-ons as you like without having to fit them into the table layout. The quick and easy way for customers to buy extra product options. This happens if you have created add-ons for the product, but haven’t entered a Regular Price for the product. The add-ons will only show in the table if the product has a price in the ‘General’ tab of the ‘Product Data’ section of the Add/Edit Product screen. If you don’t want to add a base price, then you can add it as 0.00 and the add-ons will appear in the table. This can happen if you don’t include a label for the Text or Textarea add-on. Make sure you add a label to describe the add-on field. Does it work with other Product Add-Ons plugins? WooCommerce Product Table is only designed to work with the official Add-Ons plugin available at woocommerce.com. We’ve done a lot of work to integrate the two plugins, and it wouldn’t be realistic for us to integrate with other similar plugins such as TM Extra Product Options or YITH Product Add-Ons. If you successfully test WooCommerce Product Table with any other add-ons plugins, please let us know. We’d love to share this information with our other customers.